"Beyond both light and dark he dwells, where war was waged upon the fells." —The Magic Mirror to Terra. The Keyblade Graveyard is a world that appears in Kingdom Hearts II Final Mix, Kingdom Hearts Birth by Sleep, and Kingdom Hearts III. It was first revealed in Kingdom Hearts II's secret ending, "The Gathering". 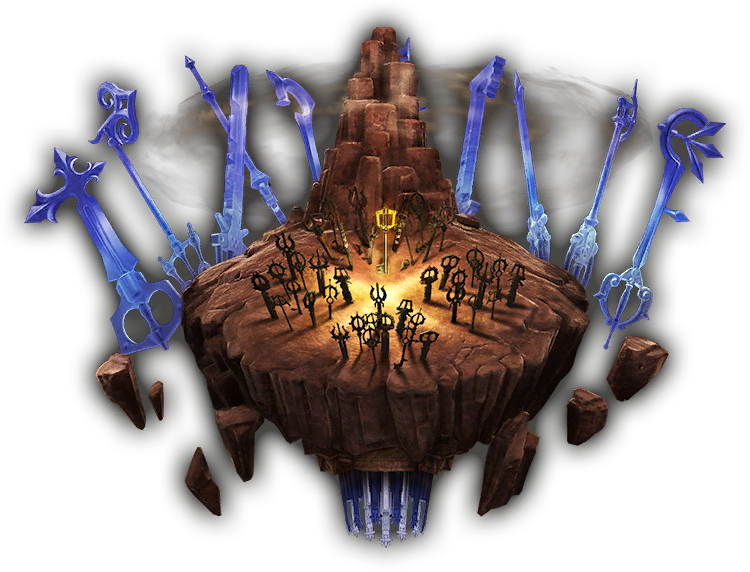 Before its formal introduction as a world, the Keyblade Graveyard is known as "The Badlands" (謎の荒野, Nazo no Areno?, lit. "The Mysterious Wasteland"). The Keyblade Graveyard is made up of unending, rocky badlands, scarred by the battles of the Keyblade War. Early on, Terra and Ventus investigate the world at the Badlands (荒野, Areno?, lit. "Wasteland"), where they run into Master Xehanort and Vanitas, respectively. Later, the Vanitas Remnant and Lingering Will appear here, where they challenge intruders to battle. Each of the heroes eventually enter the true battlegrounds of the world at the Seat of War (古戦場, Kosenjou?, lit. "Ancient Battlefield"), a small outcropping of rock overlooking the shattered vista below. It leads into the Twister Trench (砂嵐の道, Suna-arashi no Michi?, lit. "Sandstorm Road"), where literal storms of raw emotion roam freely. Within the Eye of the Storm (嵐の中, Arashi no Naka?, lit. "Within the Storm") inside each twister, Unversed lurk, ready to attack all who are captured by the maelstrom. Past the storms is the Fissure (峡谷, Kyōkoku? ), a small ravine containing a save point and a Moogle Shop. The final area, the titular Keyblade Graveyard (キーブレード墓場, Kīburēdo Hakaba?) are two crossroads, covered by the Keyblades of the wielders who fell during the Keyblade War. 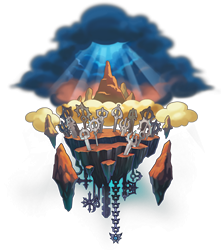 During his battle with the heroes, Master Xehanort creates a pillar of rock from the graveyard, and summons Kingdom Hearts to shine down upon it. After Master Xehanort steals Terra's body and is reborn as Terra-Xehanort, Terra's soul animates his armor as the Lingering Will, locks them both within the Will's Cage (思念の檻, Shinen no Ori? ), and forces him into a final battle. Meanwhile, Ventus and Vanitas have reunited into Ventus-Vanitas, and Ventus is forced to fight off Vanitas's control within Ventus's Mind (ヴェントゥスの精神世界, Ventusu no Seishin Sekai?, lit. "Ventus's Soul World"). Both of these areas vanish after the battle ends. Keyblade wielders eventually clashed over the world's light. Some sought to steal the light, some to usher in darkness, some to balance the two, and some to protect the light. Only Ava's secret faction did not take part in the Keyblade War. Eventually, this clash resulted in the destruction of the original χ-blade, which split into seven lights and thirteen darknesses, forever leaving the true Kingdom Hearts beyond reach. Luxu watched the conflict to its conclusion, with No Name in hand to allow the Master of Masters knowledge of how the war ended. With the Keyblade War done, the barren wasteland it was fought on remained littered with the Keyblades of the fallen wielders. The barren wasteland became known as the Keyblade Graveyard, and would remain undisturbed for several centuries. After defeating the Spirit of the Magic Mirror, Terra is informed that Master Xehanort dwells "where war was waged upon the fells", referring to the Keyblade Graveyard, but does not understand the riddle. However, as part of his plot to lead Terra astray, Master Xehanort himself calls Terra to the Badlands, then sends him to Radiant Garden to confront Vanitas. Shortly afterward, Vanitas leads Ventus to the Badlands and attacks him, but Ventus is rescued by Mickey's timely arrival. Shortly before Ventus arrives at Neverland, Vanitas finds Mickey there and abducts him to the Badlands, leaving behind his Star Shard. Ventus finds the shard and is whisked away to the home of Mickey's mentor, Yen Sid, who is able to locate Mickey. When Ventus arrives to rescue his friend, Xehanort intercepts him and reveals his plans to use Ventus to create a new χ-blade, then casts him back to the Lanes Between while mockingly advising him to question Master Eraqus. He then calls Terra back to his side and manipulates him into following Ventus and fighting Eraqus. After Ventus reaches Eraqus, Terra intercepts him and casts him through the Lanes Between to Destiny Islands, where Vanitas tracks him down and reveals that he was created from Ventus's extract darkness by Master Xehanort at the Keyblade Graveyard. At the same time, Master Xehanort kills Eraqus, destroys the Land of Departure, and tells the shocked Terra to come find him at the graveyard, while Aqua learns of these events from Yen Sid's divinations. Now aware that the Badlands were, in fact, the legendary battlefield of the Keyblade War, all three make their way there and find Master Xehanort, Vanitas, and their co-conspirator Braig. Master Xehanort sends Vanitas and his ally Braig to attempt to kill Aqua and to force Ventus to fight Vanitas, thus fusing the two and creating the χ-blade; once the fusion is successful, Master Xehanort unlocks his own heart and possesses Terra's body, being reborn as Terra-Xehanort. 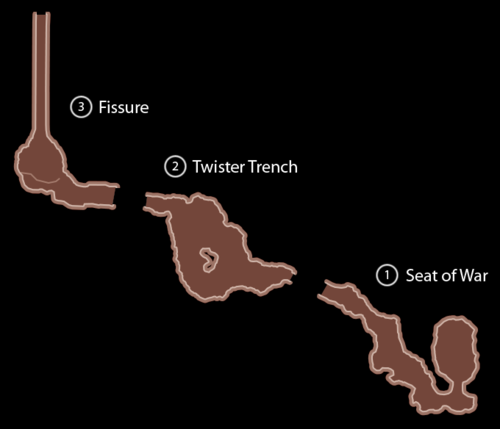 However, the plan backfires when Terra's anger animates his discarded armor as the Lingering Will, who knocks out Xehanort, while Aqua and Ventus shatter the χ-blade in the ravine below. The lightstorm created by the χ-blade's destruction rips apart the landscape and casts away everyone but the Lingering Will, who goes into hibernation while vowing to one day correct the wrongs committed by Xehanort. Master Xehanort chooses this place to fittingly recreate the second Keyblade War as Sora and his allies. Each clash between light and darkness brought him one step closer to creating the χ-blade once again. Upon the thirteenth clash between Sora and Master Xehanort himself, the legendary Keyblade was remade again and he utilized its power to once again summon Kingdom Hearts to purge the worlds in darkness as it had in the past. Using their combined powers, the guardians of light utilize Xehanort's own powers over space and time against him, to trap him in Scala ad Caelum where Sora would follow in after to finish him off. When the battle concluded, the Keyblade Graveyard returned to its natural state before the fights began. Not long afterwards, Luxu summons the other foretellers, with the exception of Ava, back at the crossroads and reveals his current form as Xigbar and explain to them his role over the centuries. The Keyblade Graveyard appears in the game's opening FMV, in which Master Xehanort battles Sora, Riku, Terra, Ventus, Aqua, Roxas, Donald, Goofy, and King Mickey at night. The capital letters in the logo for the Keyblade Graveyard slightly resemble the protagonists' Keyblades. The "K" bears resemblance to the teeth of the Earthshaker, the "E" resembles the teeth of the Wayward Wind, the "G" bears similarity to the guard of the Rainfell, and the final "D" resembles the guard of the Kingdom Key complete with the Keychain, albeit featuring Sora's Crown Pendant rather than a Mickey Head. The "teeth" of Oblivion, Oathkeeper, Sleeping Lion, Follow the Wind, Circle of Life, and Fenrir, as well as the Keychain of No Name, can been seen coming out of the bottom of the World icon. Each Eye of the Storm contains Unversed inflicted with either Slow, Haste, or an unnamed status that enlarges them, depending on the color of that storm. ↑ Mickey is an ally to Ventus during his first fight with Vanitas and to Aqua during her fight against Ventus-Vanitas in Kingdom Hearts Birth by Sleep. He is an ally to Sora during his fight with Luxord, Marluxia, and Larxene, and during his fight against Ansem, Xemnas, and Young Xehanort in Kingdom Hearts III. ↑ Riku is an ally to Sora during his fight with Xigbar and Dark Riku, and during his fight against Ansem, Xemnas, and Young Xehanort in Kingdom Hearts III. ↑ Aqua is an ally to Sora during his fight with Vanitas and Terra-Xehanort in Kingdom Hearts III. ↑ Ventus is an ally to Sora during his fight with Vanitas and Terra-Xehanort in Kingdom Hearts III. ↑ Kairi is an ally to Sora during his fight with Saïx and Xion in Kingdom Hearts III. ↑ Lea is an ally to Sora during his fight with Saïx and Xion in Kingdom Hearts III. ↑ Roxas is an ally to Sora during his fight with Saïx in Kingdom Hearts III. ↑ Xion is an ally to Sora during his fight with Saïx in Kingdom Hearts III. This page was last edited on 17 March 2019, at 20:33.